The following families have family history eBooks on this page: Ellis, Fenton, Fleming, Fuller, Gilman, Kenny, Beard-Loveland, Massey, Paul, Shaum, Slade, Thomas, Uhler, Willoughby, Wilmer, and Woodley. Welcome to Bookshelf 11 at Hawkeyes Trading Post! 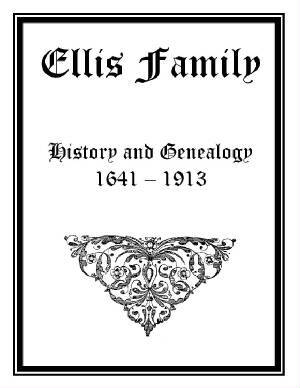 Ellis Family History and Genealogy. PDF eBook English 695 KB 1913. This publication is short, extremely well written, and the last 5 pages are produced on an old manual typewriter detailing more information on the family history. The descendants begin with John Ellis in Sandwich, Massachusetts in the year 1641. 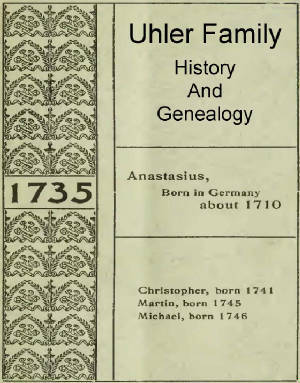 Essential information on family members extends from 1641 up to 1913. The legend is that the name originated in Wales around the year 815 A.D. The eBook is 13 pages in length and packed with genealogical information! Price $6.95 USD. 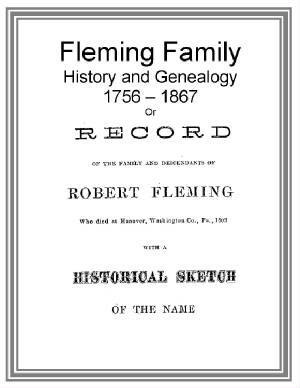 Fleming Family History and Genealogy or A record of the family and descendants of Robert Fleming. PDF eBook English 2.26 MB. 1868. This publication takes a journey way back in time, and discusses the family legend of the name having originated during the Roman Empire! The essential references are for Fleming descendants that lived between the years 1756 to 1867. There are over 400 kindred listed in the index! A very intriguing historical account of the Fleming family genealogy! Price $6.95 USD. 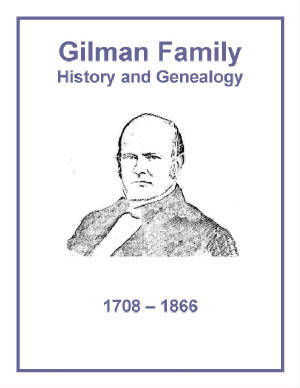 Gilman Family History and Genealogy or Family line of John Gilman of Exeter New Hampshire. PDF eBook English 16.6 MB. 1869. This publication is a very detailed historical account of the Gilman family which includes England, Ireland, and the American Colonies. There are 11 generations listed, a 15 page index listing over 800 relations, and essential dates for descendants that range from the year 1708 up to 1866. Over 300 years ago! Great genealogy for one of Americas long standing Colonial families! Price $6.95 USD. 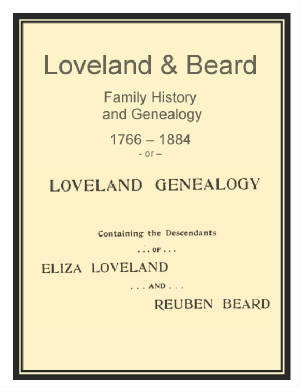 Loveland & Beard Family History and Genealogy or Descendants of Eliza Loveland and Reuben Beard. PDF eBook English 2.54 MB. 1897. Originally published as a supplement to volume II of the Loveland Genealogy over 110 years ago, this publication references descendants from the year 1766 up to 1884. A real treasure of genealogy for any member of the Beard or Loveland families! Price $6.95 USD. 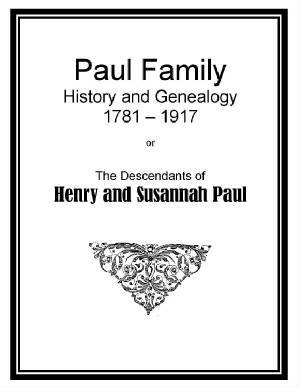 Paul Family History and Genealogy or Descendants of Henry and Susannah Paul. PDF eBook English 2.17 MB. 1915. During the Paul Family reunion of 1911 it was decided to secure information to compile the Paul Family Pedigree Chart. This is it! Descendants on the chart date from the year 1781 up to the year 1917! You could wall paper a large area with the 65 charts that are contained in this publication! A source of great genealogical information for that 136 year period! Price $6.95 USD. 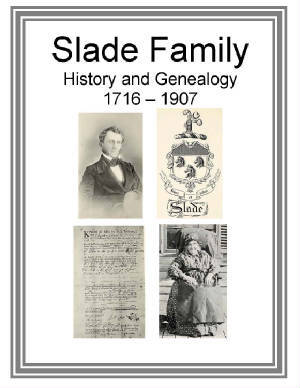 Slade Family History and Genealogy or William Slade of Windsor CT and his descendants. PDF eBook English 11.7 MB. 1910. This is a delightful family history beginning with William Slade and his wife named “Thankful” that he married in the year 1716. There are numerous rare family photographs, the Slade Coat-of-Arms with details, and a 9 page index containing over 1500 names! Also, there are 6 generations with essential information on descendants for the time period 1716 to 1907! A must for all Slade family members interested in genealogy! Price $6.95 USD. 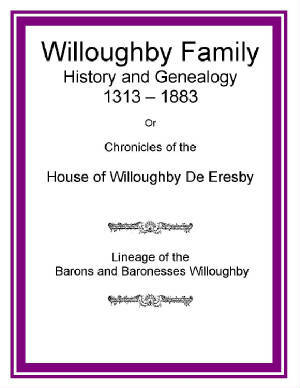 Willoughby Family History and Genealogy or the Chronicles of the House of Willoughby de Eresby. PDF eBook English 12.9 MB. 1896. This is a very comprehensive and detailed account of the lineage of the Barons and Baronesses Willoughby from the year 1313 up to the year 1883. Although the pages have somewhat faded with time, and the photographs are also of poor quality due to the acid paper used in the late 1800s, the story is still quite readable and enchanting. There are numerous Coats of Arms listed which are associated with the family. An excellent genealogical reference for any Willoughby family member! Price $6.95 USD. Woodley Family History and Genealogy or The Woodleys of Isle of Wight County Virginia. PDF eBook English 2.04 MB. 1914. 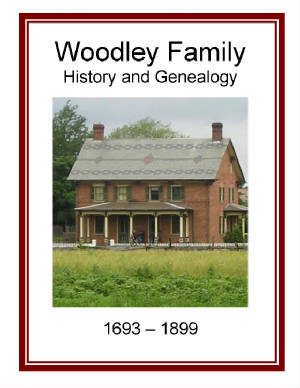 Documentation of Woodley family members extends from the year 1693 to 1899 with great information on one of Americas long standing Colonial families! Included in this publication are 6 hand drawn family tree charts created nearly a century ago! A wonderful resource for the family genealogist! Price $6.95 USD. 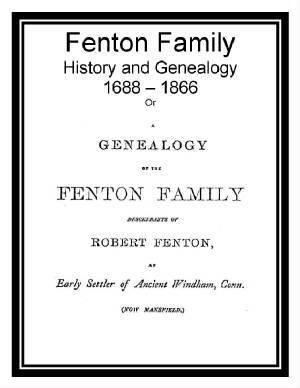 Fenton Family History and Genealogy or A Genealogy of the Fenton Family. PDF eBook English 2.34 MB. 1867. As mentioned in this eBook, the family legend points to the name originating in ancient Wales. Then immigrating to old Windham, Connecticut, Robert Fenton became a very early settler. Documentation of family member from 1688 to 1866 provides significant information with dates. Short biographies can also be found in this treasure of family genealogy! Price $6.95 USD. 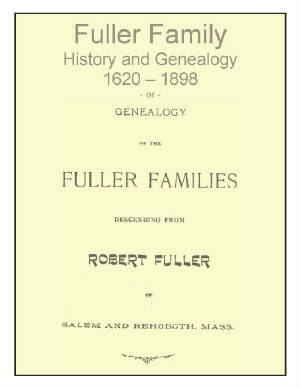 Fuller Family History and Genealogy or the record of some of the descendants of John Fuller. PDF eBook English 656 KB. 1898. Although this eBook is only 9 pages in length it contains essential dates of family descendants that range from the year 1620 up to the year 1898. Because of the publications age, the 3 generations that are documented might be unique to this publication! An essential resource for the Fuller family genealogist! Price $6.95 USD. Kenney Family History and Genealogy or The Kenney Genealogy. PDF eBook English 1.71 MB. 1909. The two Kenney brothers went to Barrington from Chatham or Harwich, Massachusetts, about the year 1761. They were with the first settlers. 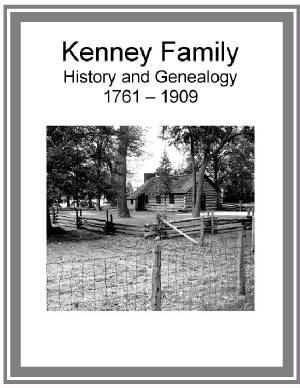 The statistical information on these Kenney family ancestors covers the years from 1761 up to 1909 with their many descendants! A great source of kinship ties! Price $6.95 USD. 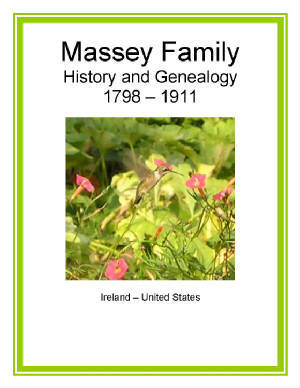 Massey Family History and Genealogy or The Account of Robert and Susan Everett Massey of Gorey Ireland. PDF eBook English 899 KB. 1912. This publication has short biographies of family members in Ireland as well as those who immigrated to the United States. There are 5 generations referenced with essential dates starting from the year 1798 up to the year 1911. An excellent source of information for anyone interested in Massey family genealogy! Price $6.95 USD. 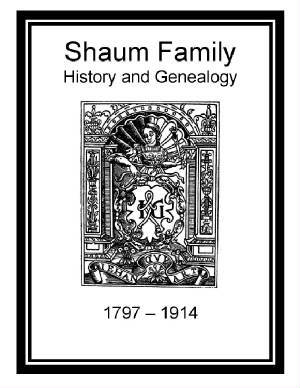 Shaum Family History and Genealogy. PDF eBook English 2.09 MB. 1915. This publication tells the amazing of how the family escaped from Germany due to the persecution of the churches between the years 1770 and 1780! Essential dates are given for Shaum family descendants stretching from the year 1797 and 1914! There are 4 generations listed in this wonderful genealogical reference for any family member! Price $6.95 USD. 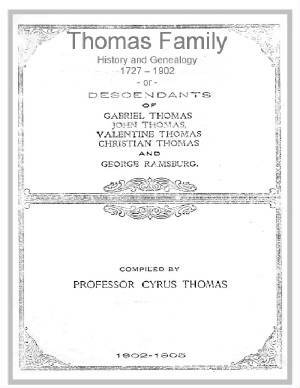 Thomas Family History and Genealogy or Descendants of Gabriel Thomas, John Thomas, Valentine Thomas, Christian Thomas, and George Ramsburg. PDF eBook English 2.05 MB. 1902. An outstanding collection of vital information with essential dates ranging from the year 1727 up to the year 1902! A 175 years worth of information! Also, there is information extracted from tombstones, and Last Will and Testament details. A great genealogical resource! Price $6.95 USD. 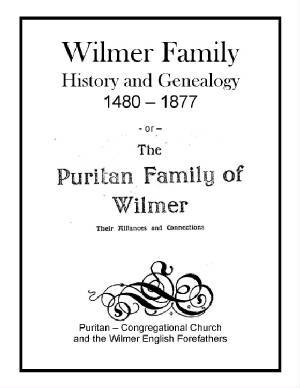 Wilmer Family History and Genealogy or Puritan Family of Wilmer their alliances and connections. PDF eBook English 1.41 MB 1909. This eBook is a fascinating history of the Wilmer family and their connection to the Puritan Church or Congregational Church as it is known today! Essential family dates range from the year 1480 to the year 1877. Predominantly the focus is on the origin of the Wilmer family in England, and their interaction in daily life of long ago. Wilmer family researchers will find a great deal of genealogical information on the ancient family ties to England in this eBook! Price $6.95 USD. Uhler Family History and Genealogy PDF eBook English 1.85 MB Year 1901. Anastasius Uhler sailed from Rotterdam via Cowes, England, and arrived August 17, 1732 in Philadelphia, Pennsylvania. He took the oath of allegiance to the British Crown in Cowes. The heads of 131 families, 473 descendants are listed in this eBook. Family members Civil War enlistments (War of 1861) Union Army, and family members enlisted in the War of 1812 are detailed in this noteworthy publication. Vital dates of Uhler ancestors range from the year 1735 to 1899, a span of over 160 years! A real treasure for the Uhler family genealogist! Price $6.95 USD.